'The Flash' Recap With Spoilers: The New Cicada Wreaks Havoc in "Time Bomb"
There is a new Cicada in the midst, but will the formidable foe be too much for Team Flash to take down? Here's what happened on tonight's episode of The Flash. As always, full spoilers ahead for "Time Bomb." Thawne is at a loss with the introduction of the new Cicada and admits he can no longer help out Nora — he wants her to tell her dad what they've been working on. The team begins to question workers at the hospital in hopes they can find out information on where Dwyer's now being kept. Nora's visibly upset and though confronted by her father, refuses to tell him about working with Thawne. Elsewhere Orlin wakes up and is greeted by the older Grace, who reveals she's from an alternate future — much like Nora West-Allen. She breaks into the police department and stills a file that Barry later finds out was from years prior. Sherloque's analysis of the symbols is complete, but he's interrupted by Cisco because someone's stolen an item from Team Flash's storage facility. They find the item, a time sphere, in two locations, indicating that the new Cicada has traveled from the future. The team follows the lead and find out the files was about her parents, who were inadvertently killed by a meta. The group connects the dots and realizes the new Cicada is Grace. 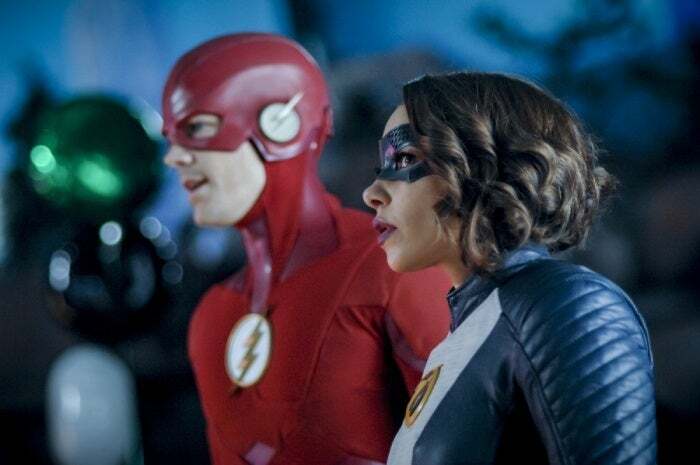 Barry and Nora are able to track down the meta to a local fun center where her daughter is having a birthday party. Before long, Grace attacks but Barry and Nora are able to stop her and evacuate the building. Grace returns to their hideout and goes on to argue with her uncle about her plans of revenge. Dwyer has apparently flipped sides, wanting her to stop her rampage. Grace attacks the hospital where the ATM meta is at with her daughter. XS is able to speed the meta away, but Grace and Barry start fighting outside. Before long, her uncle Orlin makes his way to the hospital and tries talking her down from hurting any more people but it doesn't work and she kills him. Back at STAR Labs, Sherloque wraps up his investigation of Nora and tells the entire team what she's been doing. The instant he hears that Barry locks Nora in one of the cells in the basement. The Flash airs Tuesday nights beginning at 8/7 p.m. Central on The CW. What'd you think of "Time Bomb?" Where do you think Team Flash is going to go from here? Let us know your thoughts in the comments below! 'Legends of Tomorrow' Recap with Spoilers: The Team Heads to Purgatory in "The Eggplant, The Witch & The Wardrobe"